Driver can turn both eyes and head to gain a wider field of view, and moreover can make use of peripheral vision to see objects or movements even without turning eyes. 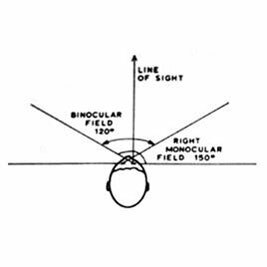 In the horizontal plane, the binocular field of view extends some 120 degrees, as in figure given below (fig. 18). Vision is sharp only over a fairly small area directly ahead. So, eyes need to be turned to focus on objects outside the foveal area. According to SAE J985 eyes generally only turn by about 30 degrees before the head is turned, which can comfortably give a further 45 degrees view to either side. In the vertical plane eye movement (fig. 19) is comfortable within 15 degrees above or below the horizontal, although the eye can see upto 45 degrees upward or 65 degrees downward if necessary. On the other hand, head can easily incline 30 degrees upward or downward. 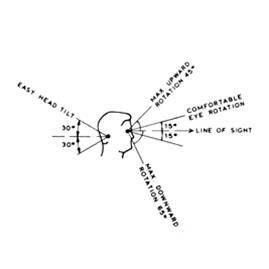 Thus, by movement of head and eye, the driver can have extended direct field view. The driver has to concentrate on direct view, that is on road. So glancing away from the road for a short period is possible. Mirror and other instruments should be close to the driver, so that driver does not require a much head and eye turn to have a look. (Adopted from Peacock and Karwowski, 1993). Variation of eye positions inside the vehicle for any driving population is considerable due to variation of seat locations and variable anthropometry of the drivers. 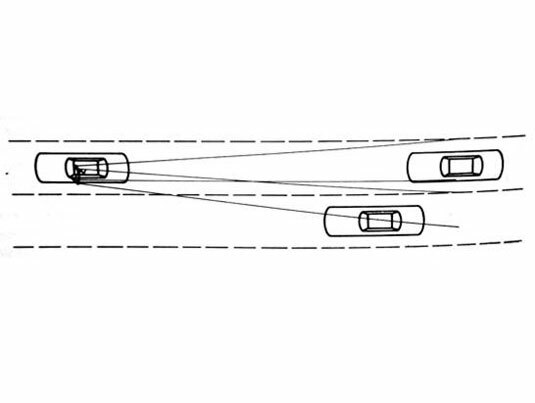 In order to address this problem, the SAE J941 ‘Eyellipse’ concept was developed as a drafting tool to define the range of eye positions within the driving population. It is based on the position of eyes of drivers in space. 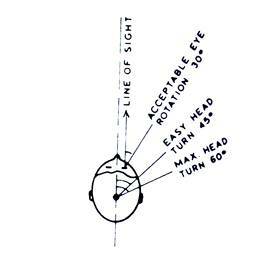 The distribution of eye position in space closely approximated an ellipsoid. During automobile design, care should be taken to provide maximum view all around either through direct vision or with the help of devices like mirror or camera. It is also important to ensure minimum visual obstruction either by vehicle components or by driver’s own body parts. This is particularly important for allowing unobstructed view of the displays on the dash board. The vision is a crucial factor in the driving task as most of the information received by the driver come through the visual sense. The clear view of road (front and rear) enables the driver a safe driving (fig. 20). Poor visibility conditions are stressful for the drivers and results in a significantly increased risk of accident. The view ahead through the wind shield has to be sufficient and clear for the driver. It enables driver to stop in emergency and necessary conditions. Similarly, rear and side views are important for maintaining speed, taking turn, exerting break or during parking. On the road driver need much longer view to anticipate and prepare for avoiding actions. Views close to the vehicle is equally important when turning left or right and maintain proper distance to avoid accidents. Fig. 16 shows the view inside the vehicle, forward and side views through glasses and rear view through mirror. Fig. 20. View during driving (Adopted from Peacock and Karwowski, 1993). 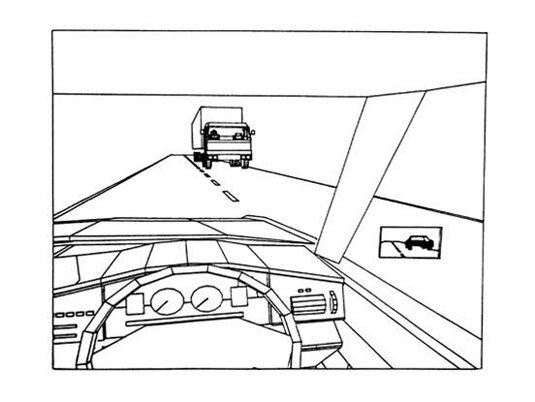 The views observed by the driver directly through eyes are considered as direct views (fig. 21). The visual field of human eye is complex, limited by anatomical and optical factors. However, it can be represented by sightlines drawn from the eye to all the points which can be seen, collectively defining the visible field of view. 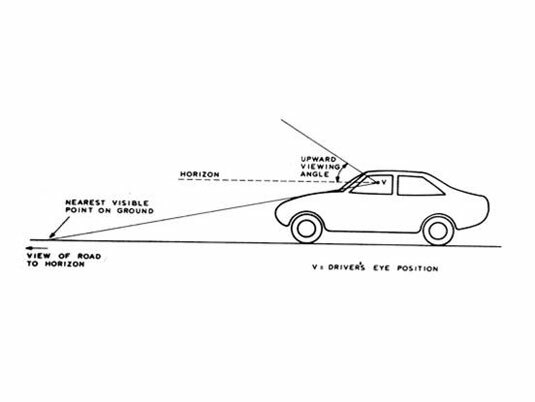 The view of driver can be represented in two dimensional geometry by considering a imaginary sight line (Horizon) passing through the driver’s eye. The viewing angle above the horizon can be considered for traffic signals and signs. The downwards view can be considered for road. Height of the dashboard and curvature of the bonnet are the two determining factor for downward view through front windshield. Upper edge of the dashboard should be at least 15 degree below that horizontal eye line of driver with smallest (5th percentile) sitting eye height. The far distance view is based on the horizon, the sightline passing through the driver’s eye. The views to the rear of the vehicle mainly obtained through the mirrors (fig. 22). This view provides information on passing vehicle, vehicle close to the rear when the driver proposing to change the lane. The reflected view of mirror can be represented in the same way as in direct view with the viewing angles. The view of image is bounded by the frame of mirror. The image boundaries can be determined by the mirror dimensions, locations of the mirror with respect to driver’s eye and optical characteristic of mirror. By adjusting the mirror the field of view of rear can be adjusted.